Constable’s famous pastoral landscapes of rolling farmland, rivers and meadows are the setting for Scene on a Navigable River, a series of new live broadcast artworks, commissioned by Field Broadcast a live digital broadcasting platform led by artists Rebecca Birch and Rob Smith. After downloading a special Field Broadcast app, the software waits quietly until the artist’s work is ready for transmission, when a live video stream opens unannounced on the recipient’s computer, tablet or mobile phone desktop. 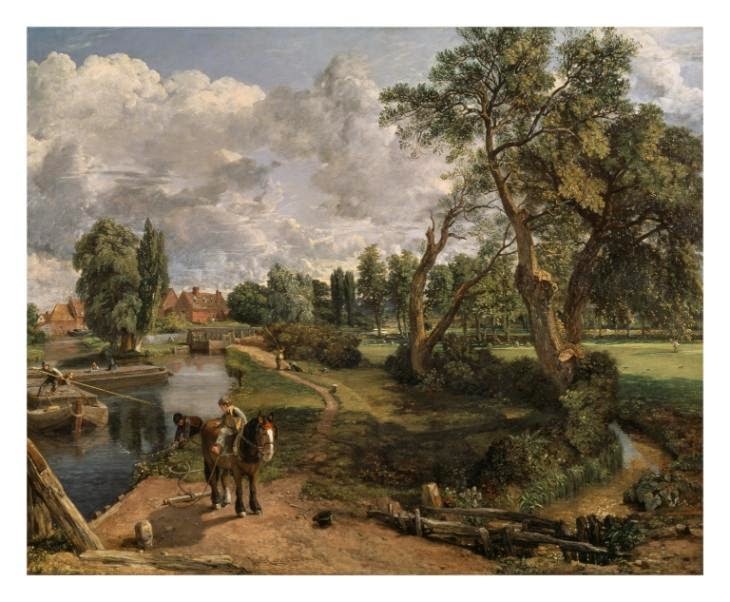 Field Broadcast have commissioned eight artists to create new works for broadcast from Dedham Vale, location of many of Constable’s paintings including The Hay Wain and Flatford Mill (Scene on a Navigable River). Lying somewhere between the real and the imagined in the carefully conserved chocolate box ‘heritage landscape’ of Flatford Mill and the surrounding area, Scene from a Navigable River forms a fragmented topology of an iconic landscape, exploring both the physical setting and its representation through the personal realm of apps, screensavers and gifs. For seven days in July, new one-off artworks from artists Adam Chodzko & Gretchen Egolf, Beth Collar, Florence Peake, Ben Judd, Paul Becker & Francesco Pedraglio, Way Through, Rory Macbeth and Ian Whittlesea interrupt everyday activities in offices, homes, trains and cafes across the globe delivering impromptu escapes into other worlds. Some take elements directly from The Hay Wain as their starting point – it’s characters, cloudscapes or colours; whilst others draw on a geographical feature – the River Stour, the wider landscape and its hidden narratives, or its contemporary presentation. Armed with laptops, video cameras and a 3G internet connection, the artists broadcast their works direct from this historical English Romantic landscape without any editing or post production. Field Broadcast was created in 2010 by Rebecca Birch and Rob Smith to commission new artworks exploring the relationship between the artist and the landscape in a single event that can only be seen via live digital broadcast. Each individual experience of the broadcast is unique, a montage of the Field Broadcast window with the personal clutter of a computer desktop: emails, chat windows, web browsers, wallpaper. Field Broadcast have commissioned projects using animation, text, performances, sculpture and live data from artists including Ed Atkins, Erica Scourti, Susan Collins, Patrick Coyle, Simon Faithfull, Matthew Tickle and Sarah Tripp. Scene on a Navigable River can only be viewed via an app downloadable from http://fieldbroadcast.org The artworks are broadcast unannounced as live, one-off events between 9-15 July 2014. Dates and times are not given for individual artists.